That’s not all. I had a simian line on both of my hands. Doubly rare! It’s where the head and the heart line are merged into a single line (sometimes called a Simian Crease). This usually means it’s hard to separate logic and feelings. It’s often associated with being a mystic, visionary, guru, or leader (best case) and a socially awkward outcast or crazy person at worst. There are also claims that it’s associated with down syndrome and monkeys. If you have a simian line, you’re either a genius or insane if you believe what you read on the internet. As if I needed yet another reason to think I’m a special! I haven’t been able to find much satisfying information online. I loved Richard Unger’s book Life Prints but it was more about what your fingerprints tell you about your life and not necessarily the lines. Still cool. My palm reader recommended Kay Packard about reading your palms to decode your life purpose. 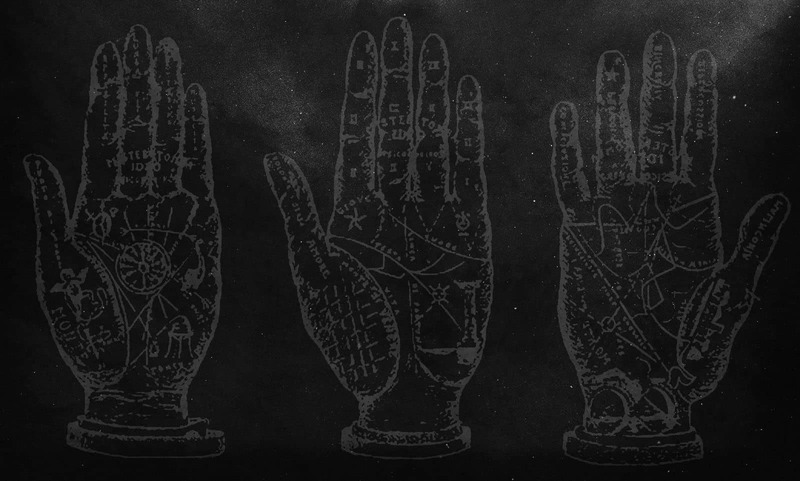 Makes me want to follow my curiosity and explore palmistry further and see what all the other lines of my palms have to tell me. Fascinating! What I do know is that I have a very strong heart and strong mind. They really do feel linked. I cannot tolerate working on something that does not actively engage my heart and my mind. I have to feel like it’s aligned with my truth. And what feels true for me is very particular. I find myself driven more by intuition rather than logic but I tend to over analyze and process my feelings mentally. And you all know I love talking about my feelings and my emotional processes! I found out one of my close friends has a simian line on one of her hands. And see all sorts of incredible markings on other hands I’ve looked at. It’s amazing how different we are and the stories they tell. The way I felt after getting “diagnosed” with a simian line was quite uplifted and inspired. To be honest, I really do think I’m a visionary with a purpose in this life. My ego wants to take ownership of this idea and use it to feel special and important. But what feels more true for me is that I am simply a conduit for a bigger purpose that is beyond little ole me. I know that I’m here to bring more love and healing to the planet. To hold space for the shift in human consciousness. To usher in the new world and be a leader in my own unique way. Really, my purpose is just to be true to myself and follow my heart and not what other people say. I know everyone has their unique purpose, and that’s what is so fun about self discovery and self actualization. You get to tap into your own specialness and super powers. Don’t buy into the notion that you’re not special or worthy. That’s just a lie to keep you from being your full potential. I’m curious to know if any of my readers has a simian line or is familiar with palmistry. What do your palms say about you? I have a more-so “unique simian than you,…. I can’t find a single print near the same…., maybe it is worth mentioning that I’ve had recurrent vivid dreams that seem to come to show FACE…. often. More so in my adult life/recently. It scares me so much, bc these awful dreams are for the most part VERY negative involving my children and husband, how can I get rid of them??? Please help!!! Hi iam sure from India New Delhi nd having simian crease in both hands nd feeling whole world is verybeautiful nd I have some important purpose in life. Double simian born April 15th. Jungian Psychology is a passion. I wonder if Carl Jung was also a simian. Working with horses therapeutically connects head and heart in my work. One simian line born on April 29th! Double simian line. Born May 1st. I have 2 simian lines born on June 7th! Connie. I will talk. Our birthdays differ tho. As I stated, I am an author with my own publishing company. IF I CAN find out enough of how others are feeling, possessing this rare trait, I will document and place in print so others may seek help and advice and share how challenging life can be at times…not being able to “fix” all around me. And, I need to stop and think more, before speaking. My words have power. Double simian lines, here. They can be changed if you focus on it. I started to change it, myself, when I was younger, but I became afraid so I stopped. I have double simian lines born October 20 1980..I must say I’ve never had a nightmare and always felt I can control my dreams.If I feel like a dream is becoming scary I can change it mid dream..
Me too I was born April 5th and have double simian lines too. Double simian. Born April 17. Wow I have both Simian lines and is born April 8th! True. I have both simians too, april 10th. Hi, I have simian line on my left hand. Born in April 16th. Hi, I have simian line on right hand. Born April 16th. Same here, any additional insights? I have double simian too. Born on April 10th 2000. My chinese grandmother told me that my hands are very rare and dangerous. hi mike, i have also semian crease on my both hand and it identical, Born April 3rd. I’ve got the same line like yours and right hand is my also my dominant and strongest one. I was born in 2nd September. I want to know more about this..
Hi. Would you please read my palm? I stumbled on your article this morning. I have double simian lines, I am extra special! I’m 42 and have just begun exploring about simian lines. Thank you for sharing your finds! I read some of the comments and I also have very vivid dreams. The bad ones have been so vivid that I no longer watch anything scary on TV. I may look into finding a reputable palm reader to learn more about this. I have a straight line in my right hand and a broken line in my left. Does this mean anything? I also have a very deep Simian line on my right hand. I knew right away this means something big for only 10% of the population have one it is very odd that is how much of our brain that we use they say. It is almost like saying that these people were put here for higher understanding and reason, just my thoughts. So funny , I have no simian lines but all these issues / occurrences .. I have a simian line on my right hand, I have never seen another person with the simian line like me until I googled what it means and why I had it and no one else. I’m glad to know that I am not the only person to have this but also happy to know that I and others are special to have this line. I also have a simian line in my right palm and yes rare in my surroundings. I to have a simian line on both my hands born Oct. 31. It is nice to know I am not alone. I am a senior noncommissioned officer a leader in the Army and I enjoy leading Soldiers and developing them into great leaders. I have a big heart and I like to analyzed things before I actually execute it. Me as well : simian crease on both hands and born on October the 31st. I also have a unique simian lines in both hands. Born December 25, 1976, Please help what does this mean? Wow 😳 We have same stars both (capricorn) and born year of a Dragon) I have simian lines on both hands and dont really knows what it means.Good luck with the gift! Hi, thanks so much for sharing this. I also have simian lines on both hands. Never thought much about it until my teenage years. But still curious to this day of what it is honestly. I have exactly simian line in both hands, just like in the pictures you show your hands . I want to know more things about it too. i also have double simian lines on both hands. My Father has one and my Brother has one. HI Allicia, nice to meet you, may I ask when is your date of birthday? I am double simian line too, same with Jeff. I have on both hands too. And have never met anyone with the same. I wonder how many exactly we are. I have on both hands, too! Always wondered what this may indicate. I worked for 25+ years as a psychotherapist and was honored to work in hospice care with people with HIV. Hi j, I am joseph from the philippines and i have both hands with simian lines. i havent met a person like me though. I too have a simian line on each of my hands and ive never met anyone like me. How does birthday affect this? i was born at 7am on the 7th of the 7th, with a numerology number of 7. No joke. My son, born 03.03.15 has one on one hand. His Nana (sadly passed away) had them on both hands. I too have a simian crease on both hands. The things I’ve read are so spot on it’s scary. I was a self made millionaire by the time I was 22. I was excessive and eccentric, I earned & wasted fortunes Multiple times. My life story is a an entertaining movie at worst. Mind-blowing. Hi Jeff, Cason, J, Sin, And Alicia, thank God I finally found other people like me. I also have the double simian in both hands, no site online is saying anything meaningful. Perhaps you could all help me understand this things. Wow! I have those lines on both hands too. I felt like you were describing me as i read your post. Its really difficult for me to separate emotions and logic. Good to know we are unique. Again I beg you….. if there is a solution to this “dream state”…. please dear GOD let me know! At this point I’m in a whole scared to sleep, it’s taking its toll! Please help!!! Seems like your scary dreams are trying to get your attention! What would a higher aspect of yourself be trying to tell you about your life right now? If your dream was sending a helpful message (disguised as a terrifying dream), what would it be? Hello Jeff, I have just read your article and really enjoyed it. I too have a simian line on both hands and so does the guy I am currently dating! What I really want to explore the sexual chemistry. It is beyond anything I’ve ever experienced and really feel it has something to do with our double simian line! I can’t find anything online about this! I was wondering if you or anyone can help me to understand this further. I have a double simian line. I am a gemini too. May 25, 1969 is my birth date.i dream a lot and i believe its a vision or forecast but i dont underdtand. Can u tell.me.more about it and how to cope with this? I am working now in a gobernment office. Only child but no parents alive. I have 1 adopted daughter. Is this my mission? I have come across both of them in my research. Interesting stuff! You have a gift not a curse,have you not had other dreams that came true? I too am a double. I have 3 children but none inherited my Simian line. Jesus used cannabis to cure his nightmares. Works a charm. I get sick of falling of tall buildings, and so a puff here or there is all you ever need- no more nightmares. Hi people with those lines are searched bye djinn to make them sorcerers or healers maibe the djinn that is haunting u is a bad one you must go to a exorcist. Maibe its a possessive djinn lover do u have problems with your partner ps. Dont show your hand to anybody in some country’s people with simian line (zouhri) get sacrificed . I have simian lines on both of my palms. It’s cool to see another person who also has simian lines on both palms. My palms almost look like mirror image of each other if you compare the prominent creases. I can see your right hand clearly in the photo and the prominent lines look a lot like mine haha. The description of people with simian lines are spot on. I wish I know someone who is an experr on palm reading. It’s just interesting. I dont know how old this article is but its nice to know that im not the only one with simian lines on both hands. I want to understand more about why we are like this and what it makes us. Though i find most articles about us really spot on. Hi ALL, I would really like to see us all get together!!!! Imagine what we could create! Hello Danielle that’s a good suggestion, maybe we should all get together, it would be interesting to meet other people with simean lines. I agree. Are you guys in the UK? Hi, I have simian lines on both hands and I live in the south of UK. Anyone else? :) I’ve been often called the witch… I have very strong intuition, predictive dreams, I’m Nutritional Therapist and I also have a degree in Art, I love science, learning, and I’m spiritual … born Feb 11. Creating a facebook group or similar like it will be great! I just chanced upon an article that spoke about Simean lines and realised I have them on both palms. Still trying to understand what it means. I have a simian line on both hands. Was born on July 1st. I have always felt a lack of direction. I’ve mastered several professions but was not entirely happy with any. I’ve had cancer twice and beat that. I found myself in a position several times to help someone emotionally through tough times. God bless you. To who else here is it incredibly obvious this man is lying? I too have a simian line on both hands! Jeff, I’ve got them too and have only seen this on one other person. The scant information out there about the head/heart line combo is true for me. My 3 yo son has double simian lines. He has severe behavior issues. He has been diagnosed with sensory processing disorder. We have also noticed he is highly intelligent. For instance he can say his ABC’s backward in the matter of 10 seconds or so. It’s crazy. He also has two toes on his right foot that are webbed. I have both too. I do feel kind of special in many occassions but not in career, i seem to doubt myself or scared of bigger responsibilities. I always need to feel perfect about something before i can persue it. Have not met anyone with simian on both hands in my lifetime. 43 yrs old now filipino. I have it in both hands and my hands are mirror images. We may be special or maybe not. We’ll see!!!! I think we are !!! Yep I’ve got them as well both hands. My father is the only person ive seen with a simian line only his left hand. I have scared my friends with crazy predictions. Far from picking lottery numbers….too bad! I have double simian lines on both palms. Mirror images. I am a teacher and care very deeply about my students. I think I do have empathy for others. I am also rare because I have O neg. blood and silver eyes. I have a nephew who has one left simian palm and his mother has neg. blood. I don’t know if there is some connection there though. I have found one of my friends also has one simian Palm. Have simian lines on both hands. Both hands identical as does one of my grand daughters. I can relate to many of the comments I’ve read. I look forward to learning more and I am going to be following webbsite. Thank you all for your comments and insights. That sounds awesome to have a Simian Crease Day. Why not? Jeff, I am a double and so is my son. June,9th and June 30th. Nice to meet you! I just found out about the double simian. Jeff, your page is great. After reading a few other sites I was starting to feel like there should be something wrong with me. I can relate to your comments about intuition. I live by my intuition. And like Alicia I have dreams that predict something in the future and I get a certain feeling when I get them. Love the heart. Love the mind. My son is very socially awkward. He does not interact very well with other children. He prefers to play alone and have control of what is happening when he is playing. I have double simian lines too and they are very dark in colour unlike Jeff in his pic. I’ve been very curious for awhile now about my palms. On my left I have a line as the one you described on my right the lines are completely different. What does this mean? i have also simian line in both hands.. :) and i know.. i exist on this earth for a very special reason . I have identical double simian lines. I am a libra. Have AB- blood which is very rare, 1/4 Native American. I’ve always been very drawn towards trying to figure out a greater meaning to life. I definitely sort threw my emotions based on logic. Therefore most people think I’m emotionless, which is not the case. I’m curious as to others blood types and if they are rare as well? My email is jenniferandgwenhart@yahoo.com would be interesting making friends who think similar to myself, I’ve felt at odds with most people most of my life. I have simian line on both of my hands and I am Libra like Jennifer. I have same issues as Jennifer. It’s so cool to find people alike. My son is 23 years old. He is a double simian. His birthday is July 12. He is a musician. He’s working on his graduate degree in music. Palmists have refused to read his palms. I have a picture. His hands look very unusual. Two lines and both deep. The top line runs clear across his hands. I would like him to meet other people to discuss this with. He’s definitely socially awkward and would never reach out on this site but once there is contact made he would be fine. He’s not good at initiating contact. When I was a kid I used to always check people’s hands to see if they had simian lines because I wanted to find someone who had the same lines as me, I’ve read up a bunch on it and after all the conspiracy theories I decided to just let it go, I don’t like letting my ego get the best of me but I think it’s a neat addition. It’s cool to at least see on the internet that other people have simian lines on both their hands too. I have it on my left hand and I feel like you just described me. I’m so in my head, I feel like I relive every conversation I’ve ever had. Like I’m looking for something. Double simian here! Scorpio…. A- blood type…. I have double simian lines. I have double simian lines too and identify with a lot of what you say. I am an incredibly emotional person and have such internal conflicts. I feel that I don’t know my own mind at all but at the same time have absaloute clarity on certain things. And I too cannot engaged in anything that doesn’t totally absorb my emotional being. I’ve found it all both a gift and a curse! Emily, let find time to get together. . . I have simian line on my both hands also. I haven’t met someone with simian line I think. I thought I’m weird or something lol. Hi Jeff! I also have simian on both hands. And yes I am very extraordinary. FATHER ,BROTHER, COUSINS, TWO LIVING CHILDREN AND TWO WHO DID NOT SURVIVE ALL HAVE FULL TRANSVERSE SIMIAN CREASES. WONDERING AT THE IRISH OR SCANDANAVIAN GENETICS. I have simian line in both palms. Hi Malek everything you said is true for I am experiencing it , everyday , I have the 2 hair whorls since birth , I met a double simian line man who told me the sa.e story , how do u know these informations ? And how to keep them away? and does the third eye have anything to do with it? I have double simian lines with another anomaly, my ring fingers are my longest fingers. My mother had a sim on one hand. Is their any connection genetically?